Researchers from Penn State University and Japan's Shinshu University developed a simple and scalable process to make strong, stretchable graphene oxide fibers. Those fibers can easily be scrolled into yarns that have strengths approaching that of Kevlar. The new GO fiber is the strongest carbon fiber ever. The researchers believe that pockets of air inside the fiber keep it from being brittle. But those fibers can also be altered to make other useful materials. For example, removing the oxygen results in a fiber with high electrical conductivity, while adding silver nanorods increases the conductivity (to the same level as copper, while being much lighter than copper). The process starts by chemically exfoliating graphite into graphene flakes, which is then mixed with water and concentrated by centrifugation into a thick slurry. Using bar coating the slurry was spread and then dried to create a large-area transparent film. The film is then cut into narrow strips and wound on itself with an automatic fiber scroller to create the fiber. GO-based fibers have been researched for years. In 2011, Researchers from China's Zhejiang University in Hangzhou demonstrated meter long GO fibers that are strong and flexible. In 2013, researchers from Rice University developed a new strong fiber material, made from large GO flakes that has a "100% knot efficiency". 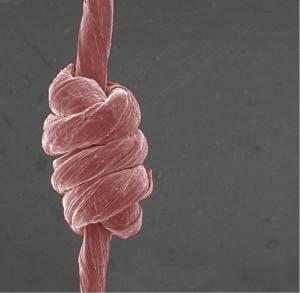 Finally, only a few months ago, researchers from Australia and Ireland developed a flexible yarn made from graphene oxide. This strong, lightweight, highly conductive and high capacitance fiber may be a great material for wearable textiles. If they are have a strentgh "approaching that of kevelar" it means kevlar is stronger.